Kevin’s Lens | A Sharmed Life! NYC…one block at a time. Last week was Kevin’s first day of his last year of school. Kevin is in his twenties now, so it has been a good run. As I am thinking about “lasts,” I can hear myself remind the kids to live where you live and enjoy being in grade 8, thirteen, or whatever the case may be. I believe these words and try to remember to live this way. Having moved to new cities more than a time or two, I know how to live this way. Yet, there I was. I woke up that morning thinking that September 9th was Kevin’s first day of his last year at school, Scott’s first day of his last day of elementary school (grade 8) and Sarah’s first day in a year where she would not go to school at all. It guess it’s a mom thing. Kevin not going to school has always loomed large. He loves school, so telling him it’s coming to an end feels like not the best news. We wrestle with when to talk to Kevin about it and what to say. I usually think I have a good idea about what Kevin thinks about one subject or another, but about this one, I’m not so sure. At the end of last year, three of Kevin’s friends finished school. The Rebecca School had a graduation ceremony to honour their achievements. Someone from school recorded it for Kevin and he watched it over and over again. Kevin’s friend Sam gave a speech, and his words brought the house down. Judging by the number of times Kevin played the speech, Sam’s words were important to Kevin. Fast forward to Labour Day weekend. Kevin and I are enjoying a last summer swing at the cottage. We were talking about coming back to New York and getting ready for school. Kevin was reminding me by pushing the iPad button 20 or 30 times that he was looking forward to riding the school bus. I take the moment to remind him that this is his last year of school and he won’t always ride the school bus. Kevin looked at me intently. I could tell he was thinking about what I had said. He flipped a few pages on his Proloquo2Go iPad app, and confirmed: Graduation, Party. These Kevin moments make me laugh. No need for my thoughts about how to break the news to Kevin. He is getting ready. As for Vikas and I, we are getting things ready for Kevin too. As the next year is filled with lasts, I will remind myself to take a page out of Kevin’s book. No need to worry. Just plan a party! It will make me smile every time. My son Kevin is 20 years old. Kevin has Mowat Wilson Syndrome, a condition that involves developmental and medical challenges. He is non-verbal (although he communicates well with his iPad), and he has motor and processing issues. From a physical care perspective, Kevin can do some things on his own, but he requires physical support for many of his daily tasks. This past Sunday we dropped Kevin off at camp for the week. Now his third time at camp, he walked up to the aisle to the stage when his name was called, showing Kevin’s comfort and sense of belonging there. It took us many years to be in a position for Kevin to go away overnight. Sure, he had had slept over at his grandparents over the years, but never with people we (he) didn’t know. When Kevin was quite young, we worked with a behaviour therapist who coached us to introduce nights away for Kevin as soon as we could, preferably no later than 16. New settings would teach Kevin that it was okay – even fun, if we could get that far – for him to be away from us. To this day I hear the therapist’s words, and though we didn’t understand it at the time, this coaching was more about teaching my husband and I to learn to be away from Kevin. Yet, it still took us many years to be in a position for Kevin to spend the night away. We certainly didn’t seek it out, and sometimes even felt guilty about it. So, when the opportunity came up, saying no wasn’t really an option. At first, Kevin went away for only one night, and then two the next time, eventually building up to being away for a week of summer camp. A few weeks before Kevin’s first time at camp, the school sent a social story about, “what to expect at camp,” with photographs of the facilities and activities there, to introduce and orient Kevin about was ahead. When Kevin prepared to go away to school camp for the second time, a year later, he was very excited. This time around, what I learned was unexpected. Kevin brought me his camp social story five times a day, every day, three weeks before the trip. He wanted to look at the photographs and talk about who was going to be there and what they were going to do. Not only did he want to go, I realized he was telling me how much he needed to go, knowing how much fun he would have. You might wonder what Kevin going to camp has to do with our roles as his caregivers. Here is what I would tell you. Meeting Kevin’s needs each day, although not always easy, is a day that speeds by and is filled with tasks and considerations. Stepping away and letting other people support Kevin is an entirely different exercise. It is odd not to know what he did for a day, let alone an entire week. When he is away I most often fall asleep wondering about his day. I remind myself though that as a mother of a 20-year-old, it is a perfectly typical moment not to know all the details. Three years later during Kevin’s time at camp, we focus on ourselves and our other two children. We eat out, wake up when we want to, go for walks, see a movie and treat ourselves to a week of doing what we want and when. Last year, during the early morning two-hour drive to pick up Kevin, I remember asking my husband if he thought Kevin missed us while he was at camp. When we walked into the chapel with the entire camp watching the end-of-camp slide show, I got my answer. The photos showed Kevin, and every other camper and counsellor too, laughing and dancing and swimming and painting shirts, and eating and sleeping and acting silly at the campfire. It is not clear who was having the most fun: the campers and their friends or the counsellors who take a week off work to attend or the therapists who give a week of their four-week summer vacation, or the mom who now helps run the camp as an old-timer who had attended since college, or all the students who are there to help. For this one special week, this group becomes family and they look after each other. It is the most beautiful form of care I can imagine. Kevin didn’t miss us. He was too busy having fun. For most of us, our voices emanate from our own vocal chords. For Kevin, our 20-year-old son with Mowat Wilson Syndrome – a developmental disability – his words are battery-charged, delivered by an app and wrapped protectively in royal blue silicone. And we love his voice. By the age of two, we knew that Kevin had severe language issues. We held onto the hope that, by age 10 – an important milestone in speech development – he would have words with which to communicate. Perhaps it was naïve on our part; it didn’t happen. When he was 13, we accepted what limited progress he had made, stopped thinking about what he could not do and focused on the everyday things he could achieve. Kevin always had the desire to be understood. He is driven to connect with people and he always used whatever means he could. Even before the iPad arrived, we had helped him learn sign language and surrounded him with pictures and other visual items that he could use to get his message across. But the results were haphazard at best. Even though Kevin learned many adapted signs, most people he wanted to talk to didn’t know his language. Given how restricted his communication was at the time, a little sadness would sometimes creep into our lives. We knew we had a boy with a story to tell and no way to tell it. Then came the iPad. Life changed slowly at first for Kevin, and then for our entire family. Through the dedication of his school team, every day new icons and words are added to his vocabulary. At more than 1300 words now, the Proloquo2Go app is the home of Kevin’s iPad voice. Built within his app are 35 pages, most with 36 words, represented by animated or real-life picture symbols. Voice output words and phrases are associated with each of the symbols. Kevin navigates these pages to share what’s on his mind – almost always with a stop at the people and activities pages. This morning, within moments of waking, Kevin flipped to Proloquo2go and browsed the talk buttons. The iPad voice greets my husband and I every morning, too, as Kevin stands at our bedroom door pushing the buttons to tell us his plans for the day – what he will be doing and with whom. A morning ritual, Kevin reminds us he wants to wear a nice shirt – especially on the days of his internships, a detail we would not have known mattered to him before. In the afternoon, Kevin is excited to tell us news of the day. Any sadness we once had has been replaced with pride and often amusement about some of Kevin’s unexpected interjections. Once, when I was talking about how Kevin uses his iPad at school, Kevin reminded me he uses it for his schedule, helping him manage his day more independently. After speaking on behalf of Kevin for 20 years now, filling in the words we think he wants to say, he now uses his own words to tell us what’s on his mind. Kevin is the author of his own story every day. With his iPad voice, he is funnier than ever, serious and intent when he needs to be, and sarcastic or “frustrated” as he will tell us if things don’t go his way. For a guy who doesn’t speak a word, this voice is clear. Today, with three years of iPad-speaking under his belt, Kevin is a changed guy. 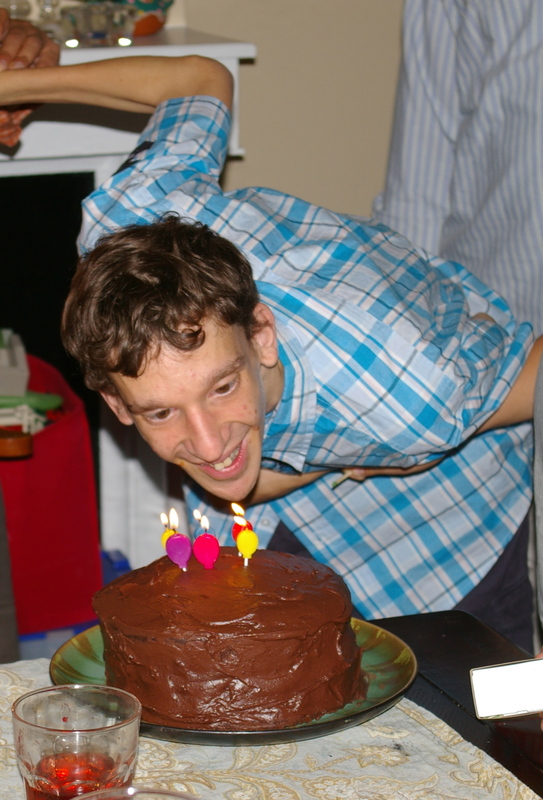 We saw his most profound communication growth at 19 and 20 – something we could have never expected. The changes we see go much beyond the words. Nothing for Kevin has been as energizing or confidence-building as sharing his thoughts. Kevin can now communicate with strangers, for example, something he could have never done before. The app helps him ask questions to people, like the grocery store clerk, about the location of a favorite food. But it also allows him to share his adventures with friends. On Monday mornings, we load his weekend photographs to his Instagram account and his Calendar 365 app. It is a very common sight now to see Kevin and a friend looking at photos and videos, sharing a connected moment. His photos and videos of activities, family and friends are precious and let him re-live his favorite moments. As the years go by, Kevin will find photos of a holiday in anticipation of what’s to come. For the rest of us, we might find ourselves humming a song from camp, for example, that Kevin has played so many times. These experiences help us get to know who Kevin wants to be and reminds us of all the things he can do. Down the road, as Kevin and his friends graduate, Instagram and other social networks will be a way to stay in touch, much like how other people his age enjoy the platform. We are so grateful the iPad helps him stand tall and be heard. People with a “special” someone in their lives know what they have to offer. Others around us and in the general population sometimes get it, but many times they don’t. They tend to associate speech with ability. These days, when Kevin speaks, people listen. Last Thursday Kevin turned 18…a milestone. Kevin anticipates his birthday like no one else I know. He blows out pretend candles for an entire week before the day, wakes up several hours earlier for many days ahead, plays the birthday song on his iPad in case we might forget, and hauls out every photo he can find to check out who he will see. Maybe it is the fatigue from the hype and the preparations that set in, but for me there is usually a “what if”part of the day. It can catch me off guard because I don’t tend to think in “what if” terms about Kevin, but on his birthday I wonder. What if Kevin could talk, could read, could write? If he had gone away to school this fall like many other kids his age, where would he go, what would he study, how would he act? Would he play hockey or basketball or ride the horses that he loves so much? Eighteen brings about a whole new category of wondering and thinking about how to plan for the future, so much so that I felt like Kevin turning 18 would mean many mixed emotions for me. The lead up to the big day started with a celebration at the cottage. Kevin entertained us all with his belly laugh as he was surrounded by his favorites: grandparents, aunts and uncles and cousins; horse magazines, chips and dip, tomato sauce and pasta; good food and cake with lots of candles that you blow out four or five times. The New York celebration began at a school with a classroom party with cupcakes baked at school from Cafe Rebecca. The weekend party had us all scavenging through Carl Schurz Park counting the park benches, visiting Peter Pan, and finding the jogger who would kindly pose for a photograph so we could check that last box on the list. More cake and more candles were blown out with the help of friends and family. Attending the Autism-friendly performance of the Lion King on Sunday was a perfect end to the weekend. Kevin loved the rhino, elephants and birds as they walked down the aisles. I loved that he could share the occasion of a theatre production with his brother, cousins and Grandma. Thomas, a friend of Kevin’s, often remarks in the middle of a gathering that we are having a LAUGHING PARTY. It has become a favorite expression because it tells me that not all parties are laughing ones and they should be. From such simple words, I am reminded to enjoy the simple pleasures of a laughing party. Kevin’s month-long birthday was a laughing party beginning to end. I wondered about none of the things I expected. Instead, I thought of where we’d be without Kevin’s goofy sense of humor and his love-of-life laugh. I felt thankful for the support we count on from family and friends and his team that challenges him at school. As it often does, what crossed my mind is when I came to realize that from this world of disabilities emerges a group of people with amazing spirit, determination, perseverance and ability. With many more actions than words, Kevin draws us all in because there are many more very important laughing parties to plan. A Sharmed Life…NYC one block at a time! We are the Sharma (and Bell) family. We are Kathy and Vikas, Sarah, Kevin and Scott. Our hometown is Ottawa, Ontario, Canada, and as of the beginning of September, we live in New York City. We have had many great chapters in our life: we have lived in Kanata, Caracas, Washington and Manor Park. This is the beginning of our new chapter, pounding the pavement on the sidewalks of the Upper East side. Not too long ago my dad gave me a binder with the emails that we had sent my parents when we lived in Venezuela. Reading back, it reminded me how much I forgot about our time there, and how happy it made me to have written memories of this unique chapter in our life. The purpose of this blog is just that: I needed a New York kind of way to share some of our adventures with family and friends and a way to capture some good times and reflect on aspects of everyday life here. We want to remember what I am sure will be an interesting chapter in our life. The blog is a way to include Sarah in our NYC experience. Sarah attends university and no longer lives with us everyday. We miss having her with us and we look to build the excitement for her when she joins us for holidays and during the summer. Kevin brings people under his spell wherever he goes. When he moves away, his wide circle of family and friends miss his joy of life and look for ways to keep in touch with him. I hope to share some of Kevin’s favourite photos and videos here so that his crew can see what he is up to. For Vikas and me, we try to take it all in. Capturing these moments will help us reflect on the simple things in life, scenes in this big city and how we view them through our Canadian eyes. This is us and it’s a SHARMED LIFE!